This black powder coated aluminum pedestal is designed to mount your keypad, wireless intercom, or other access control device, making the entry device easy to access from your vehicle. With its modular design, it is easy to install and works with a variety of access control devices. 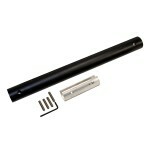 You can also easily add 20" Pedestal Extensions (GTO F103) for commercial applications or if additional height is needed. 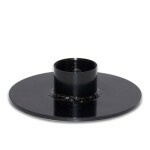 Pedestal Surface Mounting Plates (GTO F102) are also available for transforming your in-ground pedestal into a surface mounted pedestal if your installation needs change.